My biggest fear is never making it again and Sean Mcvay being figured out. But that is something every team/coach goes thru. Let’s see what we got. If that were the case you would think that would have happened after 2017 when McVay won Coach of the Year and Gurley won OPoY. But our team and offense came back even better in 2018 and went to the Super Bowl. I think it's more likely that Belichick is just a genius and the Patriots defenders played lights out that day. That whole offense revolves around mismatches that Gurley creates in both run and pass game and play action off threat of Gurley. Gurley going mental late in year for whatever reason and Cupp getting hurt handcuffed Rams and Goff. Cupp is a very underrated player nationally. Losing him was not nothing. Oline is not built to pass block every play, they got exposed. Also when teams go to press zone you can't keep running rub and crossing routes with no threat of run. You run through man and sit in zone or flood it. McVay is right, he got outcoached. Goff is only partially to blame. He didn't play well, but can still throw the rock. He isn't special, but he is good. Weird thing is defense was so weak early in the year and O was a beast. They reversed that late. Key secondary getting healthy and key O getting injured probably had a lot to do with it. Rumor is that Gurley played through a partially torn ACL. Goff lost both of his pressure-beaters (Gurley and Kupp). Is the rumor from someone that would be in the know? I've not seen that but at this point hope that is true otherwise I have no explanation for why Gurley wasn't involved in passing game. That was my hunch as well. Something definitely doesn't seem right with his knee. I'm sure they're will be more clarity to the situation in the coming months. It's also the perennial story of Kromer's lines (i.e. blocking scheme), which predates him before he came to us: If the interior line has a bad day the whole line has a bad day. And Goff has a bit of Rivers in him, whereby he's not going to be that QB that side-steps or moves laterally in the pocket (unless he just outright abandons the pocket or bootlegs) , he's a step-up into a the spearpoint type QB. If the IOL concedes ground and doesn't create that spearpoint, he's already fighting an uphill battle on a play. If he then doesn't have his blitz-breaker(s), he's Ivan Drago trying to run up that treadmill that's been ratcheted up above a 45-incline, but without the steroids. We saw this occur on Kromer's past teams when injuries and/or poor-performance took their toll on his IOL's (both in Chicago and New Orleans; but most notably Chicago when they lost Kyle Long). You guys think talib comes back and moves to safety?? Yes, he's under contract still and I expect him to stick at corner. His play hasn't fallen off enough to dictate a change of position. It's always possible, but if he can still play CB, I'm keeping him there. I feel like it's a lot more than just "one game." lol. 3? Out of 32. Yeah i'll take that ish from a 24 year old. Maybe you missed the 60 TDs, 8000+ yards, 8+ YPA, 24-7 regular season record, 1 Super Bowl appearance, and 100+ passer rating from Goff over the last two years. Yeah I agree that it’s just one game. 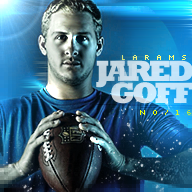 Goff is mentally tough and resilient. People made a big deal about the Falcons loss in 2017 and Goff led the team to the Superbowl the following season. As bad as the offense looked, if Cooks comes down with that td or Goff wasn’t a tad late on another throw to Cooks in the endzone, the game would be entirely different. Im confident in Goff and this team moving forward. Another offseason is just another year of growth with Goff and McVay and this offense. I expect McVay to add more things this offseason to the offense to be even more hard to defend but most importantly I expect McVay to learn how to adjust in game to how to attack defenses when his original game plan isn’t working.